Certain people say that the way to cope with a difficult situation is to put on a brave face. It is clear that these people are not Isadora Quagmire, because if they were, they would realize that the way to cope with a difficult situation is to write a couplet. 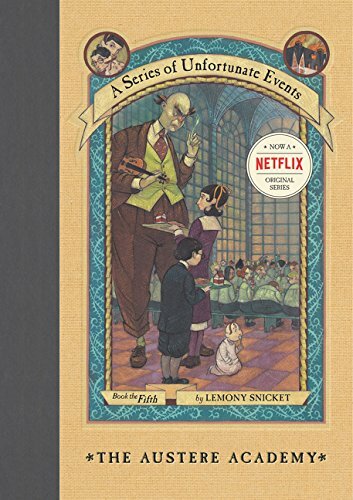 This image from the files of the Netflix corporation shows the brave faces of the Baudelaires and the Quagmires at Prufrock Preparatory School. It also contains a mistranslation of the Prufrock Prep school motto, which Klaus would surely have corrected had he seen it. If a brave face were enough to overcome adversity, then Violet, Klaus and Sunny Baudelaire would never have had to eat the cafeteria food at Prufrock Preparatory School, because they would never have been in hiding from Count Olaf and his evil theatre troupe, because they never would have lost their parents in a terrible fire. The Baudelaire orphans had some of the bravest faces around, but still, adversity always followed. "Adversity" is a word which here means miserable meals. From the moment the Baudelaires lost their parents, every meal they shared was either distastefully unpleasant, or unpleasantly distasteful. When they stayed with Aunt Josephine, they had to eat cold food. At The Anxious Clown, they had to eat greasy food. At the Lucky Smells Lumbermill, they had to eat gum. And at Count Olaf's house, they had to eat with Count Olaf. At Prufrock Preparatory School, adversity continued to follow the Baudelaires. In the wretched cafeteria, they had to cope with slimy macaroni and cheese, and lasagna that was so soggy it was deemed inappropriate for younger viewers and edited out of the broadcast. In this image, obtained by spies from the Netflix corporation, Larry can be seen dutifully wearing his hairnet at the Prufrock school cafeteria. The repetitive stress of serving dismally soggy lasagna in these conditions left Larry with his own adversity to cope with, and was deemed too disturbing to include in the documentary broadcast. And, as if that wasn't punishment enough, the Baudelaires also had to cope with Carmelita Spats. Dear Reader, you have had the adversity of reading this entire post with the eyes in your own brave face. If you are the type of person who prefers to avoid adversity, then you should close your browser right now. Or at least close your eyes. And whatever you do, don't subscribe to this series, because if you do, adversity will follow you to your inbox, where your brave face will have to cope with reading a new post from this dreadful series each week. This image of Sunny Baudelaire's brave face was obtained under suspicious circumstances from the Netflix corporation. I would think a decent person like you would prefer to spend your time reading nicer emails. But then again, I don't really know you. Since you are still here, it probably means your computer is broken, and won't shut off. And, as if a broken computer isn't punishment enough, you've been subjected to a post about adversity and cafeteria food. The answer may be culinary. Despite my poetic efforts to the contrary, the readers of this website have suffered enough. Please end this post now, and attach my recipes for delicious Classic Lasagna and Stovetop Macaroni & Cheese. It is my desperate hope that certain school administrators might find them here, and save their students and staff from the repetitive stress of bad cafeteria food.